About 70 minutes away from the Francisco Bangoy International Airport, Jared Hotel and Condotel is located at the heart of Digos City in Davao, and is accessible via regular public transport routes. Jared Hotel and Condotel has facilities, ameniti... About 70 minutes away from the Francisco Bangoy International Airport, Jared Hotel and Condotel is located at the heart of Digos City in Davao, and is accessible via regular public transport routes. Jared Hotel and Condotel has facilities, amenities, and services that ensures the comfort and convenience of its guests. Each room is fully air conditioned, and an in-room safety deposit box. The attached toilet and bathroom has a shower, with hot and cold water. Basic bath essentials, such as towels toiletries, are also provided for in each room. Additionally, WiFI internet is also accessible from within the hotel's guest rooms, as well as in public areas within the hotel's premises. Digos City has world-class tourist attractions and a breathtaking scenery to offer its visitors. Guests can swim and relax at the Passig Islet, an aqua eco-park resort, which used to the the base of the Philippine Coast Guard. Kublai Art Garden is another attraction, which illustrates the lives of the people of Mindanao. Thrill seekers will surely find their thrill fix by trying the zipline at Zip City, or at the Sibulan River where they can go on a water-tubing adventure. Nature lovers, on the other hand, will surely find Camp@tagan Lake Mirror and Hillside Resort a welcoming place, what with its natural cold spring pool, which is perfect for a good swim to beat the heat. Situated along Tulip Drive in Davao City, Ecoland Suites & Inn offers charming and comfortable accommodations, matched with true Davaoeño hospitality. The hotel is also about 10km away from the Francisco Bangoy International Airport, and is accessibl... Situated along Tulip Drive in Davao City, Ecoland Suites & Inn offers charming and comfortable accommodations, matched with true Davaoeño hospitality. The hotel is also about 10km away from the Francisco Bangoy International Airport, and is accessible via regular public transport routes, with free parking spaces available on-site. The hotel also offers airport transfers to and from the hotel, for a fee. Whether your stay is one of business or of pleasure, Ecoland Suites & Inn is sure to have all you need to make you feel right at home. The hotel has a café, that also offers room service. A business center is also available so you won't have to worry about sending that email in, or making that important call to close the deal. The hotel's staff are also willing to help you plan the perfect itinerary, to maximise your stay in the city. WiFi is freely accessible at public areas within the hotel, so that you can instantly share online your experiences at the hotel, and in Davao. Each room at the the hotel is fully air conditioned, and comes equipped with a cable TV, a minibar, and a safety deposit box to properly safe keep your belongings and your valuables.The en suite toilet and bathroom has a shower, with hot or cold water. Major tourist attractions and malls are within close proximity to the hotel. SM City Davao is just a stone's throw away, and so is the NCCC Mall. The Davao Gold and Country Club, the People's Park, and the Davao Museum are all about 15 to 20 minutes away from the hotel, by car. Earn as much as 355 GetGo points. With quality accommodations and excellent services, First Pacific Inn will make your trip to Davao City your most memorable one yet. 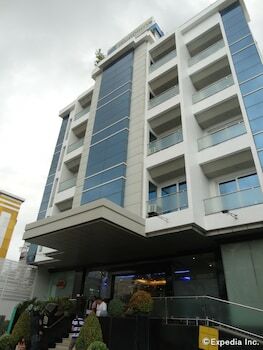 First Pacific Inn is right along Elpidio Quirino Avenue, in the heart of Davao City. The hotel is about 8 kilometer... With quality accommodations and excellent services, First Pacific Inn will make your trip to Davao City your most memorable one yet. 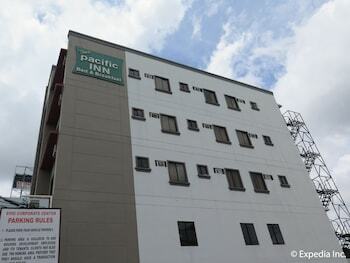 First Pacific Inn is right along Elpidio Quirino Avenue, in the heart of Davao City. 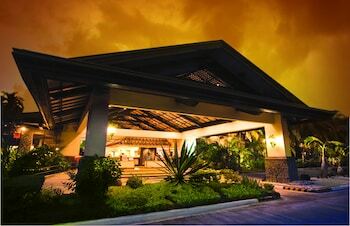 The hotel is about 8 kilometers from the Francisco Bangoy International Airport. The Gaisano Mall, on the other hand, is just a couple of blocks away. Various business establishments, government agencies, universities, and hospitals are also found within the hotel's vicinity. First Pacific Inn has a 24-hour front desk and offers concierge services to make sure that your needs and concerns are properly addressed. There is also free WiFi, and services like dry cleaning and laundry offered at the hotel. 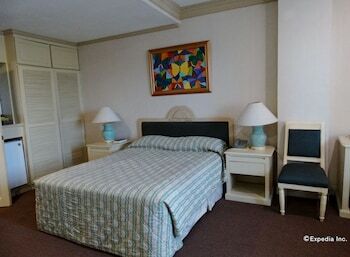 You are guaranteed to enjoy a comfortable and relaxing stay at First Pacific Inn. The hotel has an impressive selection of 16 rooms, each with air conditioning and an LCD TV with cable programming. There is also a work desk and phone, as well as a private bathroom with shower. Daily housekeeping is provided, while additional amenities like rollaway or extra beds are also available at a surcharge. Earn as much as 163 GetGo points. For travelers who want to experience a different modern city living in the Philippines, they may want to set their sights on Davao City. Said to be one of the fast-rising and safest places in the country, this metropolis may not have skyscrapers as h... For travelers who want to experience a different modern city living in the Philippines, they may want to set their sights on Davao City. Said to be one of the fast-rising and safest places in the country, this metropolis may not have skyscrapers as high as the ones in Metro Manila and Cebu City, but its own collection of modern establishments clearly indicate that it is bound to be a real industrialized spot in Mindanao. It is currently the center of commerce and trade in the region and with more and more investors coming in, greatness is truly in store for Davao City. Along with the rise of malls, entertainment centers, and office buildings in Davao City are the increase in the number of modern establishments such as hotels. But while the hospitality industry grows in the city, it will take a while for one to catch up with what Waterfront Insular Hotel Davao has achieved ever since it was established. Many may recognize Waterfront Insular Hotel Davao as one of the leading hotels in Davao. It is, in fact, much more than that—it happens to be the very first hotel in the city. When it was opened on September 1, 1961, it was called Islandia Hotel and it was designed by Leandro Locsin, National Artist for Architecture. It went through some changes until it was named Insular Hotel Davao in 1999. But even with the hotel’s reinventions, it only improved its quality until it became perhaps the most trusted hotel in Davao. For many residents, Waterfront Insular Hotel Davao is the most prestigious resort in their hometown, with many aiming to spend vacations there during holidays. For Davao City officials, the establishment is undeniably the best they can offer to VIPs. In fact, Prime Minister Shinzo Abe of Japan stayed at the hotel during his visit to Davao. He even sampled durian while he was there. Without a doubt, Waterfront Insular Hotel Davao is not only one of the top accommodations in the region but a landmark as well. With its rich history, it’s not hard to see how Waterfront Insular Hotel Davao managed to become the city’s leading hotel and resort. Located in Lanang in Davao City, it excites visitors with scenic views of tropical greeneries and the breathtaking seascape. Its beachfront serves as the ideal jumping off point to Samal Island, perhaps the most popular tropical island in the region. The hotel itself has their own jetty that can take guests to the island for a day of lounging along white sand beaches and crystal-clear waters. But even if you choose to stay along the shores of the resort, you can spend a relaxing time admiring the blue waters and watching the yachts at the nearby dock. As for the guestrooms, you will not be disappointed with what you can avail of at Waterfront Insular Hotel Davao. The accommodations are well-provided with quality amenities like air conditioners, TVs with premium channels, mini bars, refrigerators, and phones. Each room also comes with a patio and separate sitting area so you can soak up the serenity of the surroundings even while in your own private space. The en suite bathrooms have toilets and hot and cold showers. Extra beds can also be requested for those in big groups. Meanwhile, your special needs can be accommodated as well by the hotel through its thoughtful services like babysitting and even laundry. Likewise, you are encouraged to make requests at the reception for anything you need. Waterfront Insular Hotel Davao also includes several facilities like an outdoor pool, novelty shops, and an onsite playground for children. For dining, the in-house restaurants offer a wide array of delectable choices: from the mouth-watering pizzas of Pizzaiolo to the vast selection of local and international dishes of Cafe Uno. For a great time, sing your heart out at the karaoke machine while enjoying cocktails at Vinta Bar. You also do not have to worry about being connected since WiFi has been made available in the hotel's public areas. Waterfront Insular Hotel Davao is not just a getaway place. As much as it will tempt you to stay within its premises, you can always go out and see for yourself its accessibility from most of the main establishments in Davao City. From the resort, you can easily head to shopping centers like SM Lanang Premier and Abreeza Mall. For other activities, you can get to SMX Convention Center Davao, People's Park, and Mindanao Taoist Temple in no time from the hotel. Travelers would be delighted to know as well that Davao's Francisco Bangoy International Airport is less than a 20-minute drive, making Waterfront Insular Hotel Davao the best choice for jetsetters. Earn as much as 494 GetGo points. Escape the hustle and bustle of the metro and hop on a plane to Davao City. While you're there, experience luxury and comfort only at Blueberry Tourist Hotel for a most remarkable getaway you will never forget. Sporting elegant and timeless facade a... Escape the hustle and bustle of the metro and hop on a plane to Davao City. While you're there, experience luxury and comfort only at Blueberry Tourist Hotel for a most remarkable getaway you will never forget. Sporting elegant and timeless facade and interiors, Blueberry Tourist Hotel can be found tucked along Corner Jacinto Extension in Avanceña Street. This hotel is located right in the city center, and is accessible from the commercial and business districts, making it an ideal choice for both leisure and business travelers. 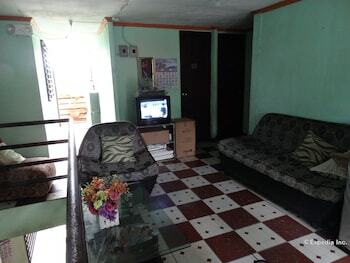 It is only less than 7 kilometers from Francisco Bangoy International Airport. Accommodations at Blueberry Tourist Hotel consist of luxurious suites, each featuring generous amenities such as an en suite toilet and bath complete with hot and cold shower, bathtub, and complimentary toiletries. In addition, each suite is equipped with air conditioning, free WiFi access, cable TV, and a work desk. Room service is available for 24 hours. During your stay in Blueberry Tourist Hotel, you will get to enjoy an array of onsite facilities such as a terrace where you can unwind and a function room to hold your meetings and events. Sample sumptuous dishes at the in-house restaurant and avail of the different services offered at the business center. The front desk is open 24 hours for any needs and concerns you may have. You can also take advantage of the free parking onsite and even the laundry services. Earn as much as 363 GetGo points. 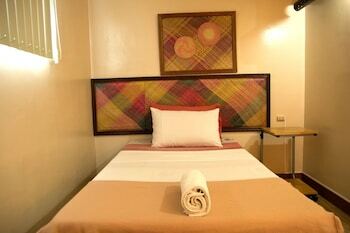 Have an enjoyable and comfortable vacation in Davao with an affordable accommodation from GV Hotel Davao. 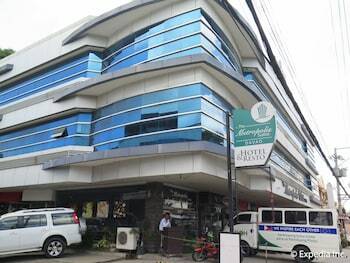 With its location along Magallanes Corner Legaspi Street in Barangay 2A, Davao City, GV Hotel Davao is approximately a 30-minute drive from F... Have an enjoyable and comfortable vacation in Davao with an affordable accommodation from GV Hotel Davao. With its location along Magallanes Corner Legaspi Street in Barangay 2A, Davao City, GV Hotel Davao is approximately a 30-minute drive from Francisco Bangoy International Airport. The hotel is also accessible from the city center. GV Hotel Davao has a wide selection of rooms for different groups of guests, all designed with comfort and practicality in mind. Travelers will have a good night's sleep in the hotel's air conditioned guestrooms and enjoy its amenities like the cable television. The en suite bathroom has its own toilet and shower and hair dryers are available upon request. Daily housekeeping services are provided. 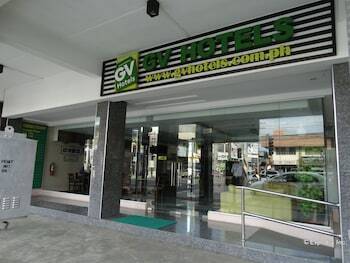 GV Hotel Davao offers its guests basic facilities and amenities for a comfortable stay in the "City of Royalties," whether you are a business or leisure traveler. Facilities include a meeting room for events and important meetings, and a front desk with a friendly staff who will assist you with your needs. Delectable meals for breakfast, lunch, and dinner are available in the hotel's own restaurant, Cafe Jordy. Guests who are coming with their own vehicles can use the free parking areas. Of course, all guests have access to the hotel's WiFi. Earn as much as 93 GetGo points. Treating guests to superior levels of comfort, The Royal Mandaya Hotel is your home away from home in Davao City. The Royal Mandaya Hotel is situated along J. Palma Gil Street in Davao City, conveniently placing it just steps away from various busin... Treating guests to superior levels of comfort, The Royal Mandaya Hotel is your home away from home in Davao City. 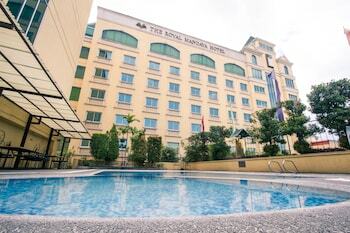 The Royal Mandaya Hotel is situated along J. Palma Gil Street in Davao City, conveniently placing it just steps away from various business, commercial, and recreational centers. It is also accessible to public transportation, but for your convenience, the hotel provides airport transfers. Mandaya means people of the highlands, the forebears of the Davaoeños we know today. The hotel honors this heritage, and combines the Mandaya's kalag (spirit) of hospitality and friendship with its services. The Royal Mandaya Hotel also has a wealth of standard amenities and on-point services such as a well-equipped business center and a tour desk to help you plan your itinerary in the city. The Royal Mandaya Hotel has a total of 181 rooms that have been designed to let you enjoy a good night's sleep. Each room has air conditioning, a flat-screen TV, free WiFi, a minibar, and a refrigerator. The en suite bathroom has a hot and cold shower. Room service is also available 24/7. The Royal Mandaya Hotel has an outdoor pool where guests can enjoy a refreshing swim after a day of touring the city. If you are yearning for a relaxing massage, The Royal Ginza Spa has an array of pampering treatments that you can avail of. The hotel's Kamayo Cafe, on the other hand, serves beverages that you can enjoy with live musical performances. Earn as much as 395 GetGo points. Earn as much as 78 GetGo points. Earn as much as 99 GetGo points. Earn as much as 373 GetGo points. Strategically located in the downtown area of Davao city. Major tourist spots are walking distance such as Peoples Park, Davao Museum, San Pedro Cathedral and Davao City Hall. For shopping authentic local products, Aldevinco shopping center is a plac... Strategically located in the downtown area of Davao city. Major tourist spots are walking distance such as Peoples Park, Davao Museum, San Pedro Cathedral and Davao City Hall. For shopping authentic local products, Aldevinco shopping center is a place to be. Just cross the road and walk 100 meters. Roxas night market also nearby for local street foods and delicacies during the night. Earn as much as 179 GetGo points. 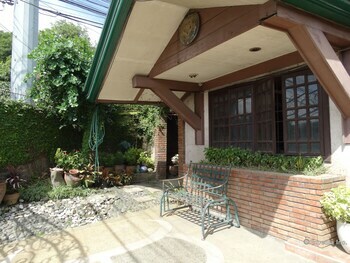 Cozy and convenient, Bahay Ni Tuding Inn & Resto offers you a warm and comfortable accommodation for your Davao retreat. Located at 160 San Pedro Street in Davao City, Bahay Ni Tuding Inn & Resto is about a 30-minute drive from the airport. The hote... 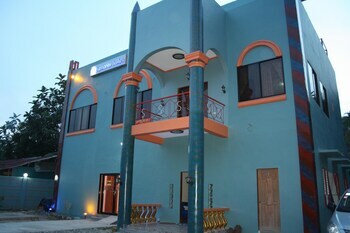 Cozy and convenient, Bahay Ni Tuding Inn & Resto offers you a warm and comfortable accommodation for your Davao retreat. Located at 160 San Pedro Street in Davao City, Bahay Ni Tuding Inn & Resto is about a 30-minute drive from the airport. The hotel is close to the center and accessible to some of Davao City's top tourist attractions. With a total of 12 rooms, Bahay Ni Tuding Inn & Resto provides its patrons with utmost privacy. Each of the rooms is WiFi enabled and equipped with air conditioner, flat-panel cable TV, private shower, and desk. Toiletries are provided while a hair dryer is available upon request. Daily housekeeping, room service, and massage services can be requested. Enjoy an array of mouthwatering dishes offered at the onsite restaurant and indulge in some refreshing drinks over a fun karaoke session at the in-house bar. Take a breather from your exhausting trip at the hotel's terrace and lounge areas. Various events ranging from intimate to grand can be held at the hotel's two function rooms. Bahay Ni Tuding Inn & Resto also offers tour and ticket assistance as well as laundry services for your convenience. There are free parking spaces for guests who bring in their own cars and safety deposit boxes at the front desk where you can keep your valuables. WiFi access is provided in both the function rooms and the lounge areas. Earn as much as 216 GetGo points. Rooms with reasonably priced basic accommodations, blended with an array of useful features and personalized service are what you will come home to at Casa Ruby Pension House. Dubbed as the "Crown Jewel of Mindanao," Davao City is a culturally rich,... Rooms with reasonably priced basic accommodations, blended with an array of useful features and personalized service are what you will come home to at Casa Ruby Pension House. Dubbed as the "Crown Jewel of Mindanao," Davao City is a culturally rich, highly urbanized city in Mindanao that presents a multitude of attractions and activities that all kinds of travelers can delight in. Situated at No. 35 Telstar corner Mabini Streets within Doña Vicenta Village, Casa Ruby Pension House— with its comfy lodgings and good-natured staff—will make you feel right at home in Davao City. 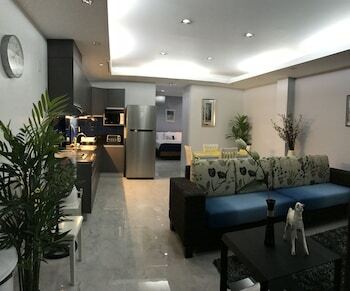 Located in the heart of the business district, the pension house is 7 kilometers away from Francisco Bangoy International Airport. It is also strategically near the city's shopping centers and top tourist destinations. After a tiring day of exploring the vibrant city, Casa Ruby Pension House's cozy accommodations make sure that you get a good night's sleep. Each of its 7 bedrooms are fully air conditioned and equipped with a private bath with hot and cold shower, cable TV, and internet access. Studio rooms have kitchenettes that open out to a lush, private garden. Guests are entitled to complimentary breakfast. In-house visitors can enjoy onsite facilities like a rooftop terrace, bar, and function rooms with facilities. Laundry and shuttle services can be availed as well. Earn as much as 243 GetGo points. With a stay at Honeymoon Suite Anavada Apartment in Davao, you'll be near the airport, within a 10-minute drive of SMX Convention Center Davao and Robinsons Cybergate Davao. This 4-star apartment is 8.5 mi (13.6 km) from SM City Davao and 1.1 mi (1.8 km) from Mindanao Taoist Temple. Make yourself at home in one of the 4 air-conditioned rooms featuring kitchens with full-sized refrigerators/freezers and ovens. Rooms have private balconies or patios. 40-inch flat-screen televisions with cable programming provide entertainment, while complimentary wireless Internet access keeps you connected. Conveniences include microwaves and electric kettles, and housekeeping is provided daily. Featured amenities include express check-in, express check-out, and luggage storage. A shuttle from the airport to the hotel is provided for a surcharge (available 24 hours), and free self parking is available onsite. Earn as much as 313 GetGo points. Earn as much as 270 GetGo points.